CYS Premier League = Have fun, love the ball! In the CYS Premier League, players get a lot of touches on the ball and improve their soccer skills by playing the beautiful game! Teams play on smaller fields in a 4v4 format. 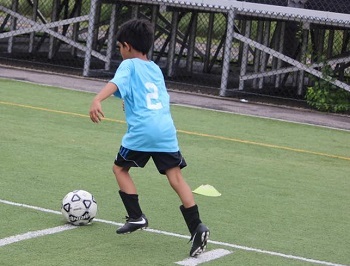 Premier players are assigned to a specific team for both the fall and spring seasons. Coaches are volunteer parents, led by experienced coaches John Grayson (PR Girls) and Haitham Mansour (PR Boys). John and Haitham are at the field every Saturday to encourage and support players (and coaches!) You do not need to be an experienced coach or player to help at Premier; great soccer spirit is the key! Players will receive a team t-shirt. WHO: 1st and 2nd grade boys and girls, as well as any 3rd graders who would prefer to continue playing in this smaller-field format. Boys and girls play in separate divisions. WHEN: Fall season runs from early September to mid-November, and spring season is early April to mid-June. Sessions are held Saturday morning rotating between 9:00 am and 10:30 am. 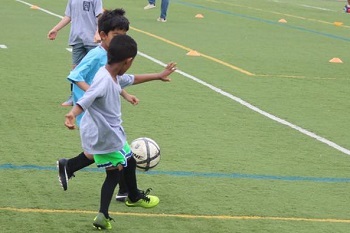 They include 45 minutes of skills practice followed by 45 minutes of game play with another team. WHERE: Premier Boys play on Cambridge Common (Harvard Square). Premier Girls play on Pacific Field (Cambridgeport). COST: $110 per season, $190 for the full year. Scholarships and reduced fees are available.